Use these Logos and Pictures in your event materials. 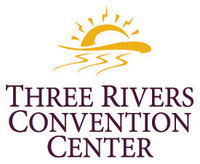 Welcome to Three Rivers Convention Center’s image resource page. This site provides resource materials for the use of Three Rivers Convention Center clients and business partners. To help you promote your event at Three Rivers Convention Center we have assembled a variety of Logo’s and pictures of the facility. Use of these materials is limited to clients with contracted events who are current on their deposits for the upcoming event.